Thank you for visiting Pacific University’s College of Optometry’s practice opportunity database. We now utilize a different platform to connect our graduates with your job openings in optometry. Pacificu.joinhandshake.com is the perfect place to post job opportunities as both students and Alumni have access to this on-line resource. You can create an account on pacificu.joinhandshake.com by clicking here. It is free to sign up! Next, request to connect with Pacific University. You must request and receive approval from Pacific University prior to posting jobs with us. Last, you will post a job. You can view the details of this process, with screenshots, by checking out How to Post a Job. Please be sure to create your account in this order, or it will not work. You will not be able to view your post until we’ve reviewed and approved it. We will try our best to make these updates every few days. If you have any questions about posting your job opportunity, the Handshake Help Center is a great resource for trouble shooting. 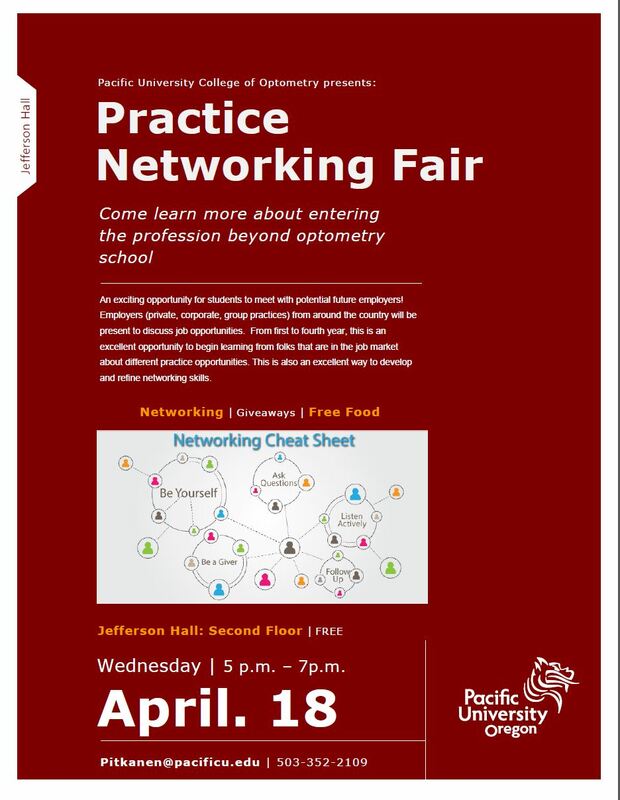 Registration for the Practice Networking Fair 2018 is now open.